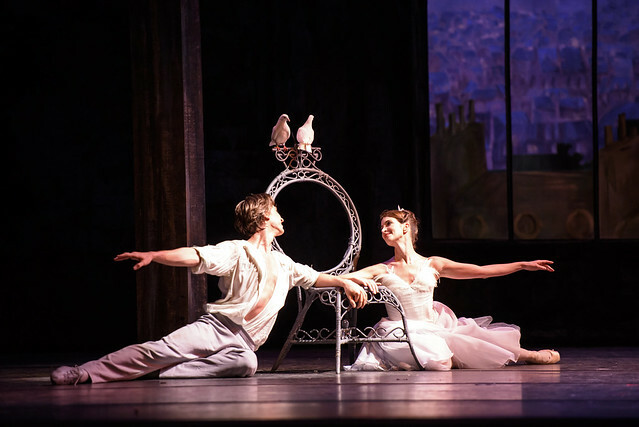 The Royal Ballet’s Rhapsody / The Two Pigeons, relayed to cinemas earlier this week, will be released on DVD and Blu-Ray. A release date and pre-order details will be announced in due course. The mixed programme, celebrating Royal Ballet Founding Choreographer Frederick Ashton, features two contrasting works he created for the Company. The performance features Principal dancers Natalia Osipova, Steven McRae, Lauren Cuthbertson and Vadim Muntagirov. Read audience reactions to the cinema screening. An extensive range of Royal Ballet and Royal Opera DVDs and Blu-Rays are available to buy from the ROH Online Shop. Can I just say how disappointing it is that you have chosen to use this cast for the DVD rather than the Hayward/Hay Choe/Campbell cast. I make this the fourth Osipova dvd we've had in the two seasons she's been principal at the ROH. Giselle (fair enough a great performance) , Swan Lake (don't know didn't see it) and most baffling of all La Fille mal Gardee which I saw live and was poor compared to BOTH the Morera and Choe casts. I appreciate that there are some Osipova fans who like nothing more than big jumps, bravura and over-acting but its not everybody's cup of tea especially when its Ashton choreography which requires the soft rather than hard sale. What's more depressing is that Natalia will probably leave soon to go and do work with b/f Polunin and then we will have DVDs of an ex RB star who pitched up for a couple of seasons with a Russian style and then scooted off. Is that really a representation of the RB? Wouldn't it have been nicer to give some limelight to some young British dancers who will be with us (hopefully) for some time and Alex and Yuhui both under-appreciated by the current management but both genuine Ashton dancers? I think this is a bit of a sell-out to those who just follow a big name. I really don't want to purchase the dvd now to make a stand but we have so few Ashton dvds available it will be difficult to hold-out. Maybe in other Ashton works yes, but Rhapsody actually calls for a more Bravura performance as it was made for Baryshnikov. Ashton didn't want to make this piece in the usual British style because of this. My mother actually saw the original cast of which I'm extremely jealous. This was her second time seeing a cinema broadcast and she thoroughly enjoyed it. She's even happier she'll have a copy to watch at home. Totally agree Rob with your comments Osipova is no Ashton dancer her lack of musicality is totally at odds with the Ashton pieces Ashton was not Dasha and flash but Lyricism and acting, neither of which Osipova possesses! As for acting -pulling funny faces is not acting! You must interpret roles with your whole body not just your face , Seymour and Nunez both have this quality they become the person whether Lise Odette or Natalia Petrovna or Isadora Duncan in the wonderful piece Ashton created for a Gala . Great news. Shame you could not also include Frankie's version of Rhapsody which I believe was also filmed. Would like to have been able to compare her's and James Hay's against Natalia's and Steven's. Although i enjoyed the cinema broadcast very much, I think it is short sighted of management to choose to issue that cast on DVD especially when it seems that the essentially preferable matinee cast of 16 January was also filmed. I understand the need for names but the comments regarding Osipova's suitability for this particular programme are valid (although it would be a shame to be deprived of MacRae's staggering performance) and lovely as Cuthbertson, Muntagirov and Kaneko (brava to her for jumping in so compellingly) were, there was something very special about, in particular, Francesca Hayward and Alexander Campbell. Surely, the point of the DVD is to preserve not just a star's performance but a performance that will help capture the essence of a work. Looking forward immensely to the DVD. I do though very much sympathise with the comments above and on the various reactions to the performances. I'm sure you'll be using footage from the performances you recorded for the final DVD so that for example Natalia's slight stumble is not preserved for posterity (it was good that the final Fille DVD managed to show an unknotted ribbon which was brodcast live). But in light of so many comments would it be possible to include as an extra the 16 January performance from just one wide angle so that we can all enjoy that wonderful performance again and better appreciate the perspective? Pity it isn't the Hayward/Hay Rhapsody and the Choe/Campbell Pigeons. I suppose glossing names will make it more marketable, but still a shame not to have such beautiful performances as those mentioned available on DVD. Sorry, should have said 'glossier'. I enjoyed the performance and am glad it will be released. I don't think the cast was as bad as people are saying, but then I'm probably not a ballet expert compared to those commenting. I'm glad the RB are releasing lots of DVDs. It can't make a lot of money? Compared to other theatres who release nothing we get spoilt! And not everyone will like the cast. Just don't buy it. At the end of the day it's just a dvd? And to the other person, I believe the reason Osipova has had a lot of DVDs realeases is more due to the performances she's been in. They haven't been released super recently & don't have confusing rights (Balanchine for eg). And there's always lots of people asking for them. Also Osipova isn't the main lead here??? I'd say the bigger draw was the 2 pigeons. Sorry to say I'm not a great Osipiva fan but I find your comments quite rude. I would actually buy the Osipova dvd. As much as I like Ms Hayward, I know where my personal preferences are. Very pleased about this DVD release. In view of the comments above, why not include the other filmed versions as well - it would make a very interesting double DVD set! I'm delighted by this! Loved Cuthbertson/Muntagirov in Two Pigeons. I agree with Rob G. I think Osipova is over rated by those dazzled by her Russian pedigree. We have some terrific talent in Hayward and Campbell, plus Hay and Choe - if only we could have them captured on DVD instead of the overblown current 'star'. I suppose management have to go with the cast that they think will sell the most, and I expect they are right given the public's fascination with their Russian protege, but it is disappointing that RB dancers of true precision, purity and grace have been sidelined for the DVD. I don't really want to get into a claque-fight, but I'm glad that MacRae's amazing performance has been recorded - it was such a bravura display, and I feel it is the male role which defines this ballet. I've seen all three interpretations of the ballerina role and I like them all. I also saw Morera the last time too. And I know Hayward is brilliant but Osipova brought something very special to the role which I loved, and I am glad to have it on tape. And there's also the wonderful asymmetrical relationship to the original cast, so I'll be buying it. I find the comments by Rob G very surprising. Natalia is one of the greatest dancers in the world today and we are lucky to have her at the Royal Ballet. She lights up the stage the moment she appears. What you call over-acting is actually a fine sense of the dramatic which is very exciting to audiences. All the choreographers who work at the Royal Ballet have chosen to create roles on her and find her rewarding to work with - I'm looking forward to the premiere of Strapless in a few weeks. It's not surprising that the Royal Ballet should want to release DVDs with her while we are fortunate enough to have her here in London - just as they did previously with Tamara Rojo and Carlos Acosta. Agree totally with Rob G. Can't think where r.a. is getting his/her distorted information from. Yes completely agree with you r.a. We are extremely lucky to have Osipova at The Royal. I have been following her for 8 years now since she was a soloist with The Bolshoi and she is magical in every way. Her Rhapsody was very emotional naturally. After all she has grown up with Rachmaninoff. It is in her soul. Let's make the most of her performances while we can. The company were exquisite in this performance. Bravo to RB. Is there any chance that the recent Cavalleria Rusticana/ I Pagliacci Double Bill will end up on DVD? It was tremendous and was also shown live in the cinema? A DVD release would be so welcome!! And I will add that I am very pleased that it will cover the Cuthbertson and Muntagirov cast - there is only one other DVD showing one of the many of Muntagirov's beautiful performances it is great that there will now be another. Will it be possible to edit out Natalia Osipova's unfortunate slip/trip about half way through Rhapsody. These things happen in live performances, but it would be a pity to archive it for posterity on DVD and Blue Ray. I am sure she would wish it edited, despite her good recovery. Like everyone else here, I would love to see Frankie's performance of Rhapsody archived. This coupled with delightful performance from Lauren, clearly at her best. I am joining the requests above, asking for a DVD of Hayward / Hay, and Choe / Campbell . The former two are true Ashton RB trained dancers and it would be wonderful to have a record of their performance, along with Choe / Campbell in Two Pigeons. Do please consider this?! I don't think it is hlepful to discuss casts in the vein of 'better than'. These are all professionals, all amazing, and personal preferences play a big role in the comments. I only want to mention the superb performance of Matthew Ball, Beatriz Stix-Brunell, Nicol Edmonds and Claire Calvert on the evening of 23rd January as I don't see their names mentioned at all. They deserve to not only be mentioned but commended for an outstanding and most enjoyable performance. Can I also add to the requests for the Hay/Hayward performance of Rhapsody to be included as a bonus - if not in place of - the McRae/Osipova one. The double bill is relatively short and if the Hayward/Hay performance was also included the running time would still be no longer than some full-length ballets like Mayerling or R&J. I was at Tuesday's performance and it was pretty special, in particular Mr. McRae!! so massive thanks to RB for putting this on bluray. I've found I'm watching my ballet and dance DVDs far more than feature films and other stuff!! It's so nice to be able to relive the performance - it's amazing how much one misses or forgets soon after seeing something live. I guess we all have our tastes in dancers and it's impossible to put all the casts on a recording, but surely the great thing is to be able to preserve these great great performances and be able to watch them at home!! I'm sure there are financial considerations, but I'd love to see all the live broadcasts transferred to disc for both dance and opera. So pleased there is to be a DVD of Two Pigeons which was my main reason to go to the cinema and the ROH - Matthew Ball and Beatriz Stix-Brunell - also excellent performances. (Yuhui Choe/Valentino Zucchetti in Rhapsody). I'd prefer their Rhapsody with Lauren C. and Vadim Muntagirov's Two Pigeons. We all have our favourites. Pity we can't Pick and mix! I agree with comments re the preponderance of Osipova in live relays. I avoided Fille mal Gardee and Swan Lake. I have to admit that Steven McRae was outstanding in Rhapsody and deserves to be on DVD. Re Fille mal Gardee I believe Laura Morera won an award for her performance as Lise. I would just like to add that I loved Fumi Kaneko as the gypsy girl - vibrant performance. Wonderful that you're doing a DVD of "Rhapsody"
I saw the live screening, and I thought it excellent. What I fail to understand is 1) the need for two presenters when all they are doing it reading from an autocue, 2) the obsessive need for spoilers. I'm relatively new to ballet, so I don't know the story lines and rather like I don't read the last page of a book as soon as I open it, I really don't need someone to tell me what I will be watching and I don't need video clips of the performance including the final scene! Any joy in discovering the pigeon step sequence and delight when the pigeon flew across the stage in the final few moments were completely lost. It's a great shame you feel compelled to do this. I too am so pleased that the DVD of the live transmission of Rhapsody/Two Pigeons is to be released. I really enjoyed the evening but would also welcome more recordings of alternative casts. What I would not give to have seen Barishnikov's performance of Rahpsody too! I am also delighted that the Royal continues to transmit to the cinema since due to disability (osteoarthritis) and finances I can no longer get to many live theatre performances and anyway up,here in Manchester we only usually get the same big classics. So carry on the good work the Royal and I will continue to buy the DVD's. Thank you to all the wonderful dancers I am now able to see too. Will the new DVD be also available for download via iTunes? I notice that the Royal Ballet have released the Roja/Acosta/Nunez casting of La Bayadere on iTunes which I now have. I would love to see more performances available in this way - a really convenient way of watching on your phone or tablet as well as a larger screen. Also a great way of attracting a younger audience who increasingly expect to be able to access material in this way. Are there plans to release more ballet performances on iTunes? Thanks for your comment. We don’t have any upcoming releases on iTunes. However we are currently exploring more in demand and online options to view our productions. Please keep an eye on the news section of the website and our social channels for updates. I strongly disagree with all the above "anti-Osipova / McRae" comments. Frankly I've seen both casts and there is absolutely not a single second of hesitation possible: the McRae performance DOES deserve to be released in a DVD, while the matinee cast was interesting and of strong quality but not unforgettable. It is different regarding the 2 Pigeons, where it is true that the Choe/Campbell cast was more idiomatic and touching, however the cinema cast was excellent too. Globally I find the "anti-Osipova" comments disgraceful and totally blind. Just take a minute and look at Covent Garden's audience reaction when she dances, It is everytime a thrilling triumph. Frankly I would not come as often as I do to the RB if casts were not at that high level. Of course I also adore Francesca Hayward and many other members of the company (Stix-Brunell, Choe, Hamilton...), but what I really dislike is that kind of "Osipova-bashing" which has taken over this blog. Just back from the matinee. If you have a record of Frankie's Rhapsody you must put it on the DVD. Stunning, simply Stunning. I too would love to see Francesca,'s performance on dvd. I really enjoyed Natalia's but Francesca's performance was pure Ashton and a total delight. It would be great to have both on dvd. I'm personally looking forward to this Blu Ray. Osipova's and MacRae's performances were fantastic, and I enjoyed “Two Pigeons” with Cuthbertson and Muntagirov. I'll definitely buy this one. Hopefully ROH will not be discouraged to make more Blu Ray's because of few commenters who seem to be more interested in personal life of cast members than performances themselves. Said that, I wouldn't mind to see other versions available as well. Any notable performance deserves to be preserved to enjoy it later. I echo the request to have Francesca Hayward on the DVD. There is an awful lot of Osipova and McRae on the ROH's DVDs already. Glad that Vadim Muntagirov will be recorded, however. There has not been enough of him in cinema relays yet. It should really have been him and Laura Morera who were shown in Fille last year. They were the first night cast, after all. I personally don't feel the need for a second cast of exactly the same performance on dvd? I very much enjoyed this cast (yes even Osipova, who I feel some people didn't even give a chance for this broadcast) & am glad we get two Ashton masterpieces preserved. I actually get a bit fed up of people always complaining. The ROH can ever do right by some people. Frankie will get her dvd chance, just give it time. You're forgetting the vast majority of non RB goers probably don't even know who she is. And what's the alternative? No Ashton DVD? As someone else has said, if you dislike the cast don't buy the DVD. I for one thank the roh for releasing this. It's a great shame not to give the audience the benefit of seeing BOTH casts in the DVD. You've filmed both casts and an intelligent public will naturally have different preferences. I personally enjoyed Hayward and Hay ahead of Osipova and McRae in Rhapsody but others will feel the opposite. Yuhui and Alex were wonderful to watch during the rehearsal of The Two Pigeons during World Ballet Day, and I unfortunately didn't have the opportunity to watch them dance the entire ballet. I was hoping that their version would be on the dvd instead, as a student, it's incredibly difficult to travel to London to watch the real thing, but Yuhui and Alex are my favourite partnership within the Royal Ballet and it would be a pleasure to watch them dance this ballet together. Yuhui is a fantastic Ashton dancer and it would be a shame not to be able to watch her full performance. Have to say that Fumi was incredible during the cinema relay, outstanding performance! Delighted there will be a DVD of Rhapsody and The Two Pigeons - thank you! Having now seen the cinema encore, I feel that the DVD needs editing at the end so as to ensure that we can see the face of the Young Man as he returns full of remorse to the studio - the relay was very gloomy. Also, why did the camera linger on the Young Girl while missing the man putting the pigeon on its perch and then moving, shame-facedly, back towards her? These crucial moments in the ballet need to be emphasised, not lost because of the camerawork/editing. Please would you be so kind as to pass on these comments to those responsible for the DVD? Thank you. Thank you so much! Vadim is an incredible dancer and I'm thrilled to know that we'll have his Two Pigeons performance on DVD. Lauren too was fabulous, I'll treasure this DVD and watch it time and again. Unlike most commenters here, I adore Natalia and will gladly buy any DVD of her the Royal Ballet releases. Please please film everything Vadim dances, I for one will buy it! He's an absolute treasure, never let him leave. There is a mistake in my previous comment: Steven's last name is McRae, not MacRae, of course. I'm sorry about this. Oh joy! Big HATS OFF and a BIG thank you to RB – these beautiful mesmerising performances performed by the very best artists in the world and now captured for our joy and delight and released on BluRay/DVD will be a WINNER! Ignore the children – they are going through their excitable phase and so they are bound to get agitated – it’s all part of growing up. The PLOT - what is allegedly taking place. The SUB-PLOT – what is a book, play, opera, ballet, or film REALLY saying? The ALLEGORIES - what do the principal characters and their actions REALLY represent? The SEMIOLOGY - what do the objects (flowers, flags, furniture, artefacts, objet d'art, attire, etc.) in a play, book, ballet, or film ACTUALLY represent? the SUB-TEXT – the subliminal message that a director wishes you to take away at the conclusion of the performance so as to form opinion and broaden ones mind. Charlie Chaplin; David Griffith; Frank Capra; Powell and Pressburger; David Lean; Terence Malik; Jean Cocteau; Joshua Logan; Roberto Benigni; Alfred Hitchcock; Martin Scorsese; and Frederico Fellini use all of these elements in a simple but very clever and effective way to press home their messages. Equally - Filippo Taglioni; Marius Petippa; Mikhail Fokine; Oleg Vinogradov; George Balanchine; Rudolph Nureyev; Peter Wright; Frederick Ashton; and Carlos Acosta use the ‘five elements of staging’ – set, costume, choreography, music, and mime - to tell a story and press home their messages. So - rather than give away the plot, the people who prepare the ‘trailers’ should deploy the ‘what happens next – well you will just have to watch the ballet to find out’ ploy - a very successful ploy extensively used by the makers of feature films to draw in its audience – and they come in their MILLIONS. As one correspondent noted, it is all well and good showing ‘revealing’ ‘snapshot’ moments – such as the fabulous pas de trois from ‘Swan Lake’ that takes place between the prince; the ‘black swan’; and ‘Rothbart’ as the black swan deceives the prince and constantly asks her father ‘what to do next’ and when to ‘go in for the kill’ in an attempt to destroy the prince just before the denouement - so as to attract those that are already ‘in the know’ – but as noted - and from my own experience of attending these wonderful ‘live cinema’ events - a large proportion of the cinema audience – particularly young people - are seeing ballet for the very first time – which is bringing with it a whole new generation of ‘ballet buns’ (balletomanes) who are then going on to take up the art – with the GUYS loving it as much as the women - and wishing to participate in it - and so putting in ‘plot spoilers’ that show part of the spectacle that awaits the viewer does steal away the element of surprise - which ‘spoils’ the moment. This is akin to having someone sat beside you who has seen the presentation telling you ‘what happens next’ as the action unfolds – which is infuriating and it isn’t necessary. I saw the matinee performance of Rhapsody on 16th January by Francesca Hayward and James Hay, then also saw the matinee on 23rd January with Steven McRae and Natalia Osipova. Steven unquestionably did a wonderful interpretation, but equally unquestionably, Francesca was much superior to Osipova in the role. Granted, Osipova had improved in the cinema relay performance, but she still did not approach the standard of Ashton performance given by Francesca. I also felt that Hayward / Hay danced OPPOSITE each other i.e. PARTNERING EACH OTHER, while Osipova / McRae were dancing IN OPPOSITION to each other. i.e. seeing who could OUTSHINE the other. I have no doubt in my mind that the H/H cast should be available on the DVD, and hope that the powers that be include it, even as an extra 'bonus' feature. It would be interesting, then, to do a poll of viewers to see which version proves more popular!! There's a challenge!! I had the good fortune to see three casts in "The Two Pigeons", and found all delightful, so I won't express any preferences of cast for it. I certainly shall buy the DVD, but I'll be disappointed if the H/H version of "Rhapsody" is not made available. It has, after all, been filmed! This is the fourth Osipova dvd we've had in the two seasons she's been principal at the ROH. I think it's ridiculous, she does not represent a british dancer, she's not a fine Ashton dancer. She has nothing of british heritage. I would also like to know why Manon or Carmen Mix (broadcasted also to Cinema) will not have a dvd? There is clearly a very strong groundswell supporting the inclusion of the Hay/Hayward performance alongside the McRae/Osipova - and I'm another supporter. Would ROH care to respond on this as a possibility? The pieces are short, so Bluray at least could certainly accommodate it. Would it not be possible, if you insist on issuing the cinema relay cast on dvd, to at least include Hayward/Hay's performance of same as an extra. Earlier someone said that Rhapsody is more bravura but I infinitely preferred the quieter interpretation by Hayward/Hay. It is equally valid. Come to think of it the ideal would be 2 dvd - Hayward/Hay Choe/Campbell being the alternative. I know this cast was filmed because I was right by one of the cameras at the matinee on 16th. from my seat up in the Amphi. So I'd also love to see Hayward/Hay's Rhapsody, plus Choe/Campbell's performance of Two Pigeons which ROH filmed on 16th Jan added to this as a dvd/blu ray extra. I understand the strong feelings regarding different casts in the Ashton Mixed programme but it’s important to retain a sense of balance! Opus Arte is a subsidiary of the ROH and we are extraordinarily fortunate that this arrangement means that we get far, far more ROH recordings both operatic and ballet, than any other Company in the world. But Opus Arte is a commercial company with a global market and Ms Osipova is an international super star, while Ms Cuthbertson and Messrs Muntagirov and McRae are jewels in the RB crown. People will buy their DVDs and Blu-Rays, as delighted as I am that two major gaps in the Ashton repertoire are to be filled. We have been extraordinarily lucky in having Ms Osipova in the RB and, rather than trolling her with unpleasant and very personal comments, we should be welcoming her with open arms. The Ballet world is harshly competitive but other dancers will get their chances. Ms Osipova and other principals have earned theirs and I look forward to seeing them, along with the next generation of RB dancers in the 2016/7 season. Thanks for all your comments about the upcoming Rhapsody / The Two Pigeons DVD and Blu-Ray release. Unfortunately we aren’t able to release the Hayward/Hay performance or include it as a bonus feature. As many of you have noted, there were cameras in the auditorium during the performance on 16 January, but these were only used for a camera rehearsal prior to the live cinema relay later in the run. Therefore there is no footage of the Hayward/Hay performance available for us to use. Now you have called time in the debate of which performance of Rhapsody is to be represented on DVD, could you please answer my earlier question as to whether the Osipova slip/trip on stage can be edited out on the released artwork. Please don't tell me that it wasn't noticed. Occasionally minor edits are made to DVDs for artistic purposes - this will be explored in post-production for the Rhapsody/Two Pigeons DVD/Blu-Ray release. Thanks for the reply. There were a couple of other points where it would be good to have a response. A number of people have commented on the concentration on close ups at the expense of being able to appreciate the organic whole - particularly in Rhapsody where we have the six men and women. Some DVDs do include as extras footage giving a much wider perspective - swans, snowflakes etc. I'm sure any extra footage of the superb Royal Ballet soloists would be hugely welcomed and enable us better to appreciate Ashton's genius. It's good to be able to draw on several performances for assembling the final DVD and I fully support judicious editing. Hopefully this would also ensure that Vadim's careful settling of the first dove on the chair is included. Finally I do hope that you're able to confirm that the 16 January tapes are to be included in the Royal Ballet's own video archives. What a treasure trove that must be and it would be great to know more about it. Thanks for your comment and apologies for the delay in replying. The tapes will be included in the Company's internal archive which - as well as recording performances for posterity - is used by dancers preparing for roles. Thank you also for your email suggestion about a feature focusing on the archives. I've fed your comment about close-ups and editing back to our post-production team. Thanks for the response Mr. Shipman What a shame. Perhaps you could mention to the powers that be that whilst we do appreciate these DVD's being released and we really do love them, plus we do love Natalia's dancing there is more than one wonderful dancer who may not yet be credited with being a principal who is worth presenting to the rest of the world. I'm thrilled it's being released - it was my first time seeing it, and I loved both ballets. I can't comment on which dancers should be included, though I think the ballet world and fans alike would benefit from a variety of principals' performances being preserved, so we can enjoy many principals, rather than just one or two. If you have an embarrassment of riches, embrace it - don't keep using the same people. I have never seen such an extensive debate on the release of a work of art on DVD. The shear volume of public interest and the wishes of the vast majority of the paying public are clearly recorded for ROH to see. Quite apart from a small minority asking for these opinions to be ignored or stifled, it is pleasing to see that ROH are not going to ignore them and these observations should be carried forward into planning of future presentations and releases. I thank Mr Shipman for his reply to my question. Don't edit out Opsiva's slip. Dance students need to see what a brilliant dancer does when she makes a mistake, and they need to realize that a professional keeps on going and finishes well! I would amend Wheeldon's statement about Osipova to "the greatest ballerina of our time." I eagerly await the DVD. This is great news! Sad to see the negative responses though. I think it is important to remember that only a short time ago we didn't have the option of buying these ballets on dvd. What a privilege now to be able to watch time and again in our homes and on the move. It certainly thrills me and brightens my world so thank you. Just one niggle though - Alice in Wonderland was also downloadable to mobile device, why aren't the others? I would so love to have them on my phone and i pad. Thank you. There is no such thing as a negative response. All responses are given by the public in the best interest of future performance and the ROH. Critical feedback is as useful as praise when evaluating a service. All comments made in this forum are based on honest observations by reviewers and in return, the ROH will value them and actively demonstrate that they care about what the public thinks. It is no different to restaurant operators wanting honest feedback from 'Tripadvisor'. This is not a 'look how good I am' forum. Osipova and McRae are great dancers, a pleasure to see individually or together, and I eagerly await the publication of the DVD. But when will Osipova be scheduled to dance at Covent Garden again? Her omission for the current season has caused talk of further injuries. A simple question, When is this DVD actually going to be released? It gives me no pleasure in saying this but when I compare the recordings of ballets filmed by the BBC and the same works filmed for streaming by your in- house team that have subsequently been released on DVD both the lighting levels and the choice of shots are better on the BBC recordings than on your own. The BBC recordings give a better account of the ballet as a whole. Those filming then seemed to understand when the audience needs to see the full stage and when it needs to see groups of dancers or individual dancers. The choice of shots was better. There were very few close ups because the assumption was that the audience wanted to see the whole dancer in motion. As far as lighting is concerned cameras may be far more light sensitive today but stage lighting levels are not always adequate for filmed performances.. The Bolshoi streamed ballet performances are well lit and they don't suffer from an obsession with the close up. I get the impression that considerably more thought is given to what their audience is going to experience when they see a streamed performance than is the case with yours. It is almost as if the Bolshoi approach their streamed performances from a ballet goer's perspective and with the idea that they must give their audience the very best experience of the performance that they possibly can. Unfortunately that does not seem to be so much of a priority at the ROH. The Opera House response is a statement that you give priority to the enjoyment of the two thousand or so people in the theatre over the thousands who can only get to see your performances by attending ones that are streamed. It suggests that the ROH does not understand that its cinema audience is just as important as the one in the theatre. It does after all support you through its taxes. I find it very strange that the ROH has not woken up to the need to treat the cinema audience as its main focus for performances that are being streamed. The Bolshoi seem to know and understand this. Perhaps it is something to do with the company's history and the fact that it has long been used in soft diplomacy but the Bolshoi gives the impression that it is concerned to ensure that its public thinks the very best of it whereas the ROH still too often gives the impression that it thinks it is doing the public a favour by permitting it to see its performances. I was wondering when the DVD is going to be released? The recording is due to be released in September 2016. Do keep an eye on our social media for further updates! The recording is scheduled to go on sale in September 2016. Be sure to follow our social media channels for notifications about upcoming releases.